Portrait of Keying, ca.1845. Credit: [British] Department for Culture, Media & Sport. Keying and his two aids Hwang Antung and Hienling arrived at Hong Kong on June 23, 1843, in HCS armed steamer Vixen, to administer the exchange of the ratified treaties on June 26. He was also to engage Pottinger in tariff negotiations which had not been included in the Treaty of Nanking but were essential for its practical implementation. These discussions would then lead to the supplementary Bogue Treaty 虎門條約 signed on October 8, 1843. Pottinger hosted a feast at his official residence in Hong Kong to honor Keying, who attended with Hienling and Hwang. It was at this evening that the Ch'ing Imperial Commissioner had behaved in such a bizarre manner that had both impressed and bewildered his English host. Pottinger must have thought what transpired as an important piece of intelligence that he described vividly, in great detail, the somewhat eventful evening in an official dispatch he sent to George Hamilton-Gordon (4th Earl of Aberdeen), Foreign Secretary, dated July 5. 1843. Here's the extract of the letter that concerns the dinner. This portrait of Keying, commissioned by himself, was the work of an unknown Chinese painter who, according to the British Department for Culture, Media & Sport, was active between 1800 and 1899. Keying had this painting sent to Pottinger in ca.1845 as a memento. The painting was, after the passing of Pottinger, in turn kept by his son, Henry, and by Henry's daughter, Ethel Adeline, who married Henry Meysey Meysey-Thompson, 1st and last Baron Kearesborough, and by Ethel's daughter, Violet Ethel Meysey-Thompson, who married Algar Henry Stafford Howard, owner of the Thornbury Castle [whereat King Henry VIII and Anne Boleyn had stayed for ten days in August 1535] and a direct descendant of Thomas Howard, 4th Duke of Norfolk, and by Violet's son from her first marriage, Giles Alexander Meysey Giles, Lieutenant-Colonel, British Army. Giles donated the painting to the Ministry of Works in 1960. The painting (gouache and ink on parchment), measured 250x125cm, is kept at the Foreign & Commonwealth Office in Whitehall. It is unknown whether it is actually on display. "In the evening the Imperial High Commissioner Keying came, according to his engagement, to dine with me, and after he and his two companions had made themselves comfortable by laying aside their mandarin caps and upper dresses, which is the custom at such parties in China, we sat for a few minutes in the drawing-room whilst dinner was being served. During this short period, Keying's attention was attracted to the miniatures of my family which happened to be on the table, and he desired Mr. Morrison to explain to me that he had no son himself, and therefore wished to adopt my eldest boy, and to know if I would allow him to come to China. To this I replied, that the lad's education must first be attended to, but that stranger things had happened than his seeing Keying hereafter on which his Excellency rejoined, ' Very well, he is my adopted son from this day. His name (which he had previously ascertained) shall henceforward be Frederick Keying Pottinger, and until you send him to me, after he is educated, you must allow me to keep his likeness. To this proposal I could make no objection, and I accordingly gave him the picture. Immediately after his Excellency expressed a strong wish to have Lady Pottinger's miniature also—but about giving it I made some little demur, and before the matter was either way settled dinner was announced, and we went to table. " I supposed the thing would be forgotten; but when dinner was partly over, Keying again introduced his request—said that he would send me his wife's likeness in return, and that he wanted my whole family to take back with him when he went to Nanking, and eventually to show to his friends at Peking. I felt it was impossible to refuse this flattering request, and I had the miniature brought, and put it into his hands. He immediately rose, and placed it on his head, which, I am told, is the highest token of respect and friendship—filled a glass of wine, held the picture in front of his face, muttered some words in a low voice, drank the wine, again placed the picture on his head, and then sat down. 'The whole of this extraordinary action was per- formed without apparent reference to any one being present, and formed quite a scene. He then delivered the miniature to his principal attendant, who was standing behind him, and directed him to send it home in his state chair, in which his Excellency had come to dinner, with all his official suite. Afterward he expressed his deep obligation to me for the gift I had bestowed on him, and inquired, through Mr. Morrison, what present he could send to Lady Pottinger that would be acceptable. I wished to evade giving an answer to this inquiry, and said I should think of it, and let him know next morning ; on which he asked, 'What ! am I the Governor- General of the Two Kiang, and cannot get my order obeyed !' At last, to satisfy him, I told him some piece of embroidery would be, as his gift, highly prized, and he had a memorandum made of it. "Soon after he proposed to sing a Tartar song, which, I am told, is customary at their convivial friendly parties—and on my saying that I should be delighted to hear it, he began with a very animated and loud voice. The couplets he sung, I have since been informed, were allusive to the peace that had been concluded between the two countries, and, likewise, to his great personal friendship for me— and, at the close of it, he took a rich golden bracelet, made in the form of a puzzle, with two clasped hands, off his own arm, and put it on mine. He then explained to me that this bracelet, and its fellow, had belonged to his father, who gave them to him when he was eleven years of age—that he had worn this one for upwards of forty years, and had left the other with his wife at Peking, and that it contained his name in the palm of one of the hands in mystic characters, and that he had some friends in every part of China, who would, on my producing it, receive me as his brother. " In the course of the evening, he told me that he expected to go to Peking, in three or four years ; that he would then send for me ; that, in the mean time, I must correspond with him, whether I remained in China or returned to England; that if Taoukevang (the Emperor) saw me, he would give me a two-eyed peacock's feather, the highest honor in China, and that I had gained a great reputation and much distinction, not only in my own country, but in every part of this empire. After we rose from table, and retired to the drawing-room again, I presented his Excellency with a handsome sword and belt, which I had commissioned by Lieutenant Colonel Malcolm from England, for the purpose of sending to him, and with which he was highly pleased. He immediately buckled it on, and though it was a very warm night, and I begged him to lay it aside, he sat with it on whilst he stayed, and went to his chair of state to go home. Just before he went away, he put on my shoulders his own upper dress which, he said, was made of silk that had been given by the Emperor Kielong to his (Keying's) father when he was Prime Minister. "On the evening of the 26th the whole of the troops were out, and after the exchange of the ratifications they fired a feu de joie and marched round, the officers saluting the Imperial Commissioner, who seemed greatly struck with the whole ceremony, and expressed his admiration of the appearance and regularity of the men as to their dresses, movements, &c. We afterward sat down to dinner, a very large party, at which the Chinese high officers entered with great spirit and good feeling into the conviviality. Keying himself asked many officers to drink wine, and was asked by many, and as his Excellency had been complaining of a cutaneous disorder, it was hinted to him, by Mr. Morrison's desire, that he ought to be careful ; to which he answered—'Tomorrow must take care of itself ; I am too happy to-night.' Then, turning to me, he was about to address me in a whisper, when he suddenly seemed to recollect that I could not understand him, on which he expressed his chagrin that he could not tell me his secrets, and desired Mr. Morrison to explain to me that if he got tipsy in the joy of his heart, I must find him a bed for the night. "When the dinner was over, I proposed a bumper toast, with all the honors, to ' the healths of the Queen of England and the Emperor of China, and that the peace which had that day been ratified between their Majesties, might be eternal,'—on drink which, the Chinese officers most warmly joined. I discovered, in the course of the evening, that Keying was a great proficient, or at least amateur, in music, and whenever the band played any particular tune, he fashioned it to some of his own native airs, and sung to it in a low voice. This led to a proposal to his Excellency to favor the company with a song, which he did immediately, with great good humor; and as Kwang and Hienlien (assistants to the Imperial Commissioner) followed their chief's example, and they all three called on different officers to sing in return, the evening passed away most jovially and agreeably; and we did not separate till a late hour. Just before we did so, the Commissioner and two Chinese officers gratified the company, by playing one of their favorite games at convivial parties, by one party rapidly throwing out his fingers whilst the other guesses at the numbers they are supposed to represent, and whoever loses drinks a glass of wine, a forfeit which they scrupulously enforced. On one occasion, when Keying was playing with Hienling, and the latter lost the game, he was about to have a glass, already half full, replenished, on which Keying taunted him with evading his proper forfeit, and called on him to fill a bumper." They were most probably playing a game of mora 酒令 (zauling). There were nine ranks 九品 in the Ch'ing bureaucracy. The first rank being top and the ninth lowest. Each rank was further divided into a sub-rank of 'full' 正and 'associate' 從. 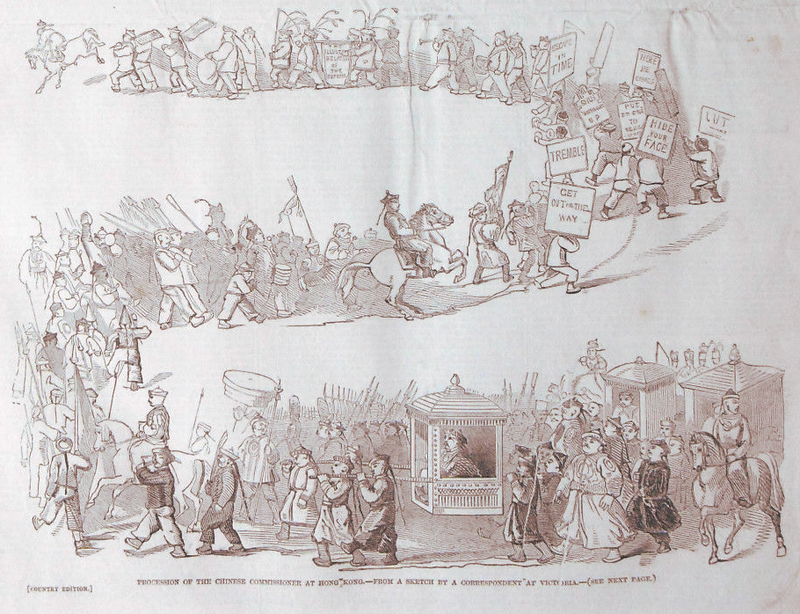 A caricature of the procession of Keying at his November 1846 visit to Hong Kong. Unfortunately no image of his 1843 visit was found. Credit: The Illustrated London News, No. 197, Vo. VIII, for the week ending February 7, 1846. In contrast to Pottinger's length description of the dinner, Keying's recital of his Hong Kong trip was exactly 65 words long. The following is an extract of Keying's memorial giving a brief account of his trip to Hong Kong. The extract was cited in the Imperial Rescript dated July 30, 1843. Susanna Maria Cook [or Cooke], Pottinger's wife whom he married in 1820, bore him three children, viz. Henrietta Maria, Frederick William and Henry. Frederick was 12 when the Ch'ing chancellor of the highest rank and of royal blood told his father he was to adopt the English [as far as Ch'ing officials of the time is concerned, anyone from the Great Britain was an English] boy as his son, and the child's name would henceforth be known as Frederick Keying Pottinger. It all sounds adventurous and exotic, but in reality, no ritual of adoption was performed since Frederick had never set foot in China. 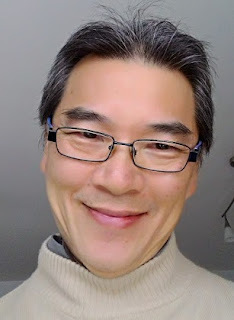 There was also no reference to Keying's notion to adopt Frederick, the Pottinger - Aberdeen letter aside, in all of the English or Chinese material I've perused. It seems that the only thing that link Keying and Frederick was their relation / association with Pottinger, and the one thing they had in common was the disastrous events which struck them in the year 1858. Keying died that year; he was ordered by his grandnephew, Emperor Hsien-feng, to end his own life by hanging. In that same year, Frederick had done squandering the entirety of the family fortune his father had left him a mere few months ago and resorted to exile himself to Australia under a false name.